For the next few weeks, about half an hour before sunrise, Mercury will peek over the southeastern horizon for observers in the northern hemisphere. Use brilliant Venus to locate it. The next few weeks offer an excellent opportunity to see the hard-to-spot planet Mercury. Because Mercury orbits so close to the sun, it never strays far from the sun in our sky. The best opportunities come when Mercury reaches "greatest elongation" from the sun, which happens next on Friday, March 14. 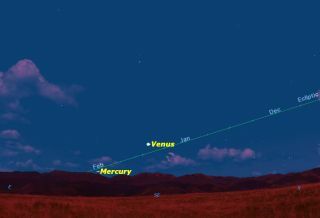 Observers in the southern hemisphere will get a better view of Mercury because of the favorable tilt of the ecliptic, the path of the sun and planets across the sky. All apparitions of Mercury are not created equally. The ecliptic, the path of the sun and planets across the sky, is sometimes almost perpendicular to the horizon, giving lots of room for Mercury to clear the horizon. At other times, the ecliptic is at a very shallow angle, making Mercury hard to spot. Mercury’s visibility also depends on where you're observing from. The upcoming apparition favors observers in the Southern Hemisphere, while making a much greater challenge for northerners. Compare this with the view from Cape Town, South Africa, where Mercury and Venus will be due east, and well above the horizon (and the ecliptic will be almost straight up from the horizon). Mercury is a planet best appreciated with binoculars or the naked eye. Through a telescope, it presents an extremely tiny "half moon." Because of its low altitude, it is severely affected by the Earth's atmospheric effects. It appears to boil and bubble, and is often smeared with color because of the prism effect of our atmosphere. An interesting trick used by observers to improve the view of Mercury is only possible during a morning apparition like this one. Locate Mercury at the optimum time, about half an hour before sunrise, and then continue to follow it in your telescope as it rises in the sky with the sun. Once it gets at least 15 degrees above the horizon, the atmospheric effects diminish, and you'll be treated to a steady view of Mercury's tiny disk. In a telescope you can see that it goes through phases just like Venus and the Moon. Observers with computerized telescopes or mounts with accurate setting circles can observe Mercury when it's high in the sky during daylight hours. But be very careful to keep your telescope pointed well away from the sun. It's hard to predict exactly what path a computerized telescope may follow to reach Mercury, so keep well away from the eyepiece while it is slewing.